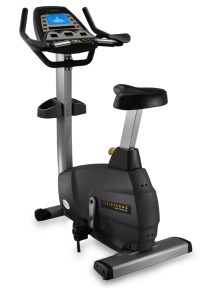 The club quality Livestrong U1x upright bike by Matrix is backed by a premium warranty and best-in-class components. The workout profile window is a 7" blue backlit LCD screen. Readouts include time, distance, calories, speed, level, watts, METs, heart rate, and profile. UPDATE: Johnson Health & Fitness is no longer making exercise bikes or any other equipment under the LiveStrong name. For a comparable bike check out the latest Horizon & Vision exercise bikes at the official company store. Other features include contact heart rate grips on the handlebars, telemetric HR monitoring, on-the-fly program changes, race-type handlebars with contoured elbow rests, and a max user weight of 400 pounds. Programs of the Livestrong U1x upright include Manual, Intervals (hill interval, random interval), Goals (time goal, distance goal, and calorie goal) Multi FX+ (constant watts, random), Target Heart rate, Weight Loss, Fit Test, warm up, and cool down. Several reviews done on the Livestrong by Matrix cycles have mentioned many of the same positive points such as the ultra-smooth and silent drive system, the seat feels superior in comfort to competitors’ models, and the self-powered console means the bike can be set up anywhere – even in a room with no plug-in. Finally, the exercise bike is backed by a generous warranty of 5 years for the brake and parts, plus 2 years on labor. Like its inspiration, pro cyclist Lance Armstrong, the $2,795 Livestrong U1x upright bike is a winner and a good choice for use in deluxe homes. These Livestrong/Matrix cycles offer superior user comfort, club quality components, and results-driven programming. In addition, purchase of a Livestrong bike helps to support cancer research, as a portion of each sale is donated to the Lance Armstrong Foundation.